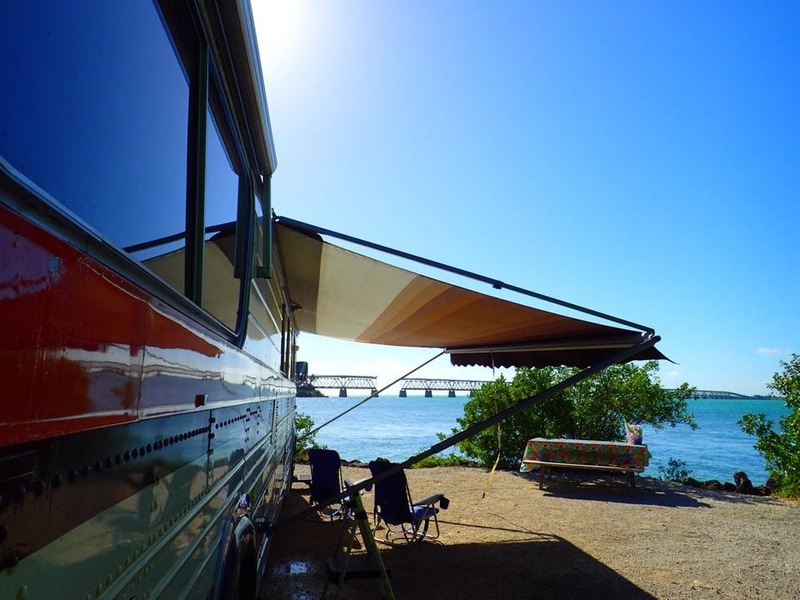 Once again we return to our favorite state park, Bahia Honda in the Florida Keys. 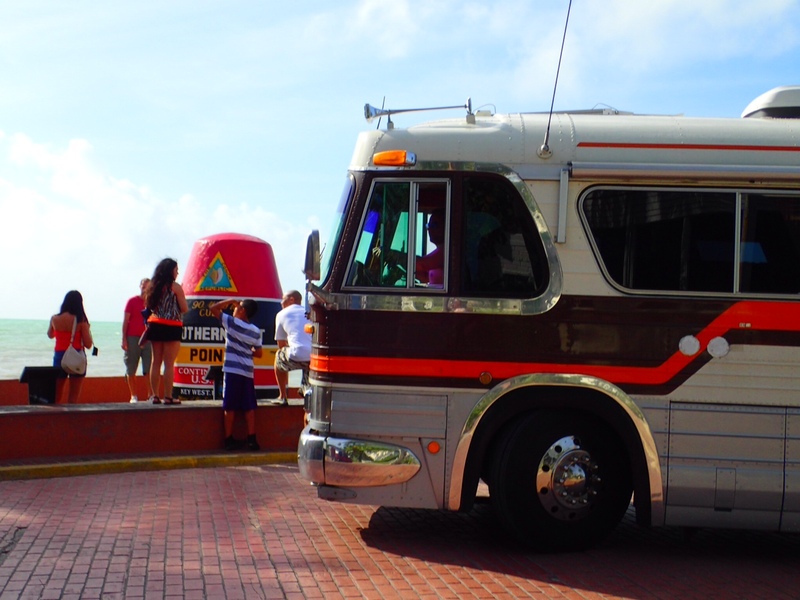 Witnessing our arduous 40 mile journey from Key West, one might suppose that our pace, intended as it is to circle the entire country in one year, might be a bit shy of that necessary for, er, success. But! But! We have a plan, and our initially slow pace will pick up as we leave Florida, but it is Winter and one should be a bit hesitant to leave The Keys this time of year. Besides, we made this particular trip to BH State Park a bit more exciting by driving down the relatively narrow roads in Key West in order to get a photo of the Big Kahuna in front of the big fake buoy designating mile marker 0 and the southernmost point of the U.S.
Manuevering the Big Kahuna for a photo in front of the Southermost point. Because we did not make our reservations 11 months in advance, as is advisable to lock in a multiple day stay on the water during the peak winter months, we had to rely on our standard “check on line every day for cancellations” technique in the months leading up to our intended arrival. It paid off, although we did have to move three times in the four days we stayed. Next year we will be far more prepared as we plan to lock in our reservation at the maximum 11 months out window. 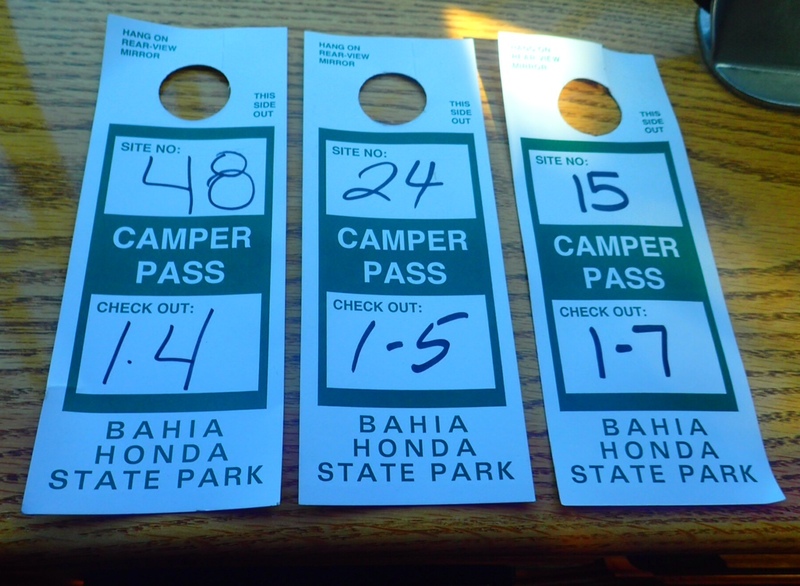 Our three site passess for the four day stay. No worries, we got our reservations and enjoyed a four day stay, with the Nieves clan joining us again for the first two days. 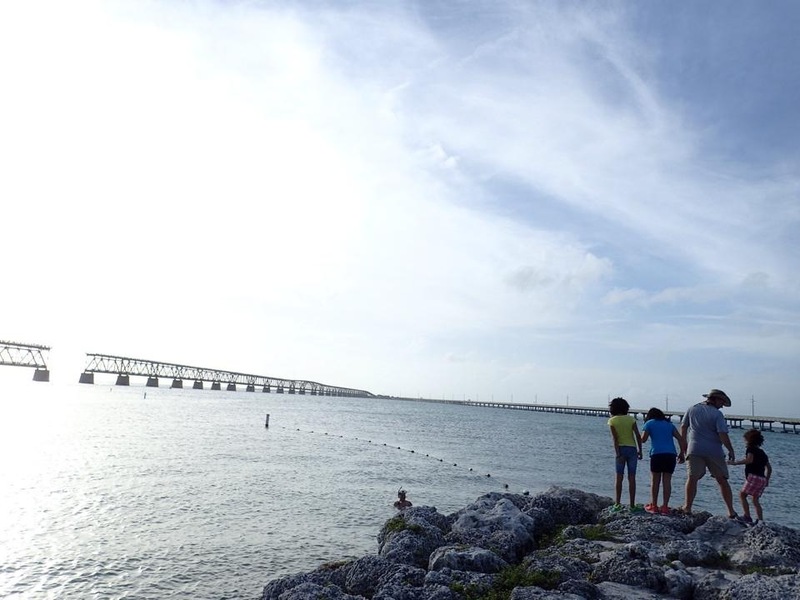 I will say that our commitment to Bahia Honda might appear strange to some visitors, largely because your experience at the park will depend significantly on the weather induced water clarity. This stay, for instance, was not particularly great, with cloudy and rough water the first two days and only mediocre snorkeling and wading conditions the last two days. If this were some one’s only visit, and snorkeling or related activities were a primary part of their enjoyment, then they might be forgiven for wondering what all the fuss was about. I can attest that aside from the wonderful cove beach, the great little family friendly nature trails, and the spacious full hook up RV sites, when the weather is right the water is fantastic. The cove offers a nice protected almost “no skill required” area to snorkel with a very reasonable chance of seeing sting rays and sea turtles. The lengthy beach on the opposite side under certain conditions offers a fantastic wading experience through knee deep clear water that is as close as you can come, short of a glass bottom boat, to snorkeling with your face out of the water. The view from our best spot of the three. 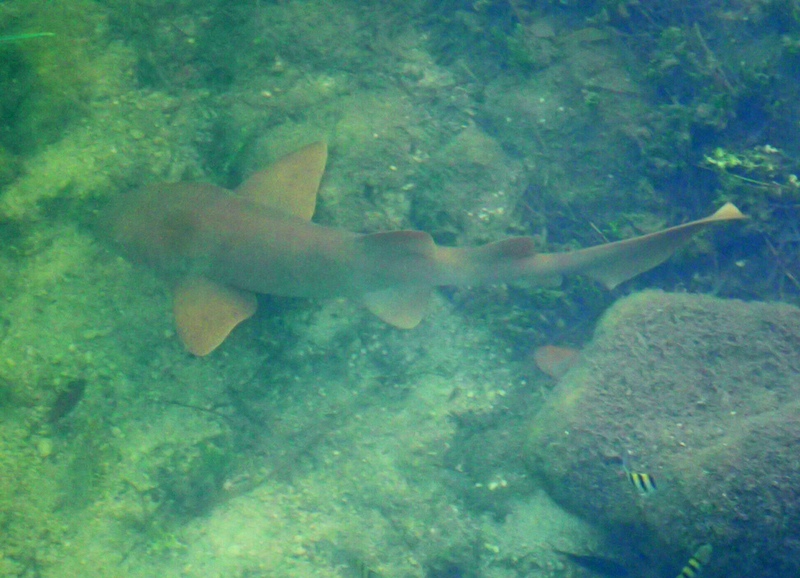 And besides, on this visit alone, even under questionable conditions, we saw a manatee up close and personnel, a small nurse shark in very shallow water, gorgious iguanos and bird life, and the pleasure of watching an ininga hunt underwater right below us on the dock. In all my years in Florida I have never actually been able to watch with such clarity one of these odd diving birds swim and search for prey. Fantastic. 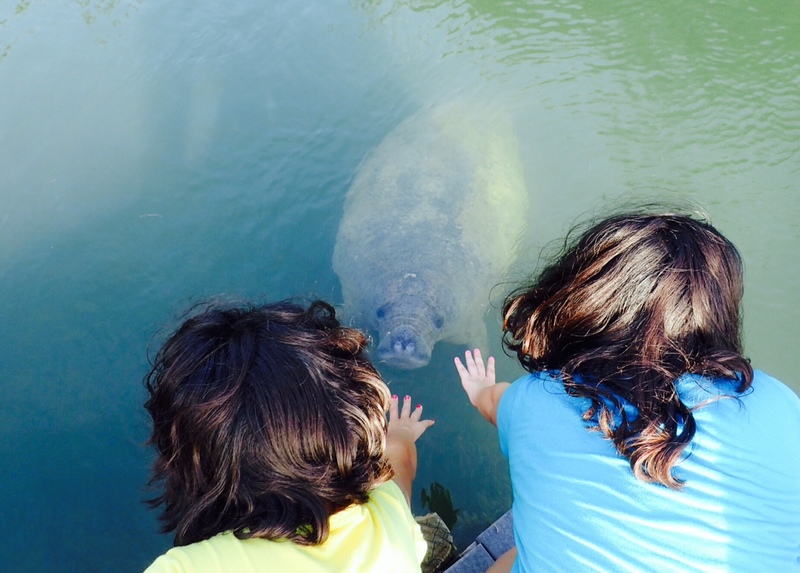 Antonella and Evangeline near the Manatee. And no, they can’t touch it. Or take it home with them. Seen from the marina dock. Our last evening we hosted a small sunset get together with our nearest neighbors, even moving indoors for a few more glasses of wine demonstrating that the Big Kahuna can entertain eight adults without too much crowding. Jack teaching the girls the inherent safety of walking on sharp coral rock outcroppings while wearing flip flops.